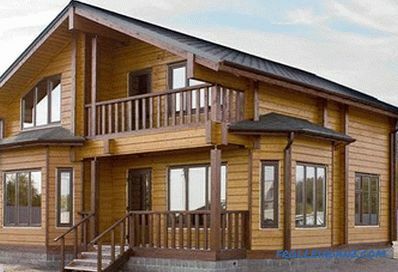 In the process of building wooden houses, special attention is paid to the joining of logs. The tighter the connection, the higher the structural strength and the longer the life of the dwelling. 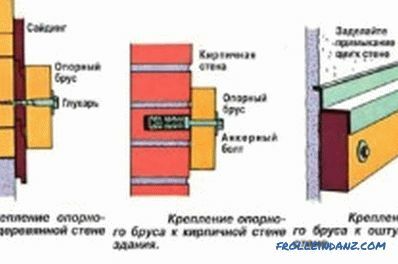 In addition, the thermal conductivity of a building depends on the density of the joints, which is of prime importance in cold regions. That is why many people prefer to build houses from profiled timber, the surface of which has special grooves. 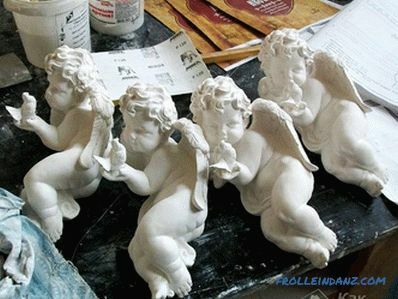 Thanks to this treatment, the construction process is faster and does not require complex equipment. In order for a house of profiled timber to be of high quality, the entire timber must be sufficiently dry, of equal size, without cracks and other defects. 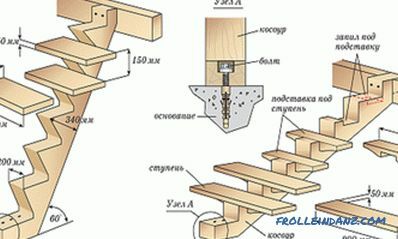 In order to correctly calculate the amount of lumber for a house, it is necessary to make a project. Even if you plan to build with your own hands, a specialist should be involved in designing, since any errors in the calculations can have serious consequences. Knowing the parameters of the house and the size of the building material, you can easily calculate how much logs you need to purchase. Special attention should be paid to the quality of the tree: the entire timber must be sufficiently dry, of equal size, without cracks and other defects. If the wood has black spots, it is better not to use it. 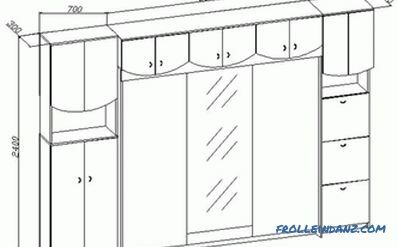 Scheme of options for connecting the profiled bar to each other. When the material is purchased, you can proceed to the construction of the foundation. The most practical basis for a wooden house is a shallow-tape foundation, but only on dry areas with dense, stable soil. If there is a high probability of flooding or the ground in the area is too heterogeneous, it is recommended to make either a pile or a columnar foundation. When choosing a ribbon base, the depth of its laying should be within 60 cm, since wood is a fairly light material. It is recommended to strengthen the foundation with a frame made of reinforcement consisting of two belts. 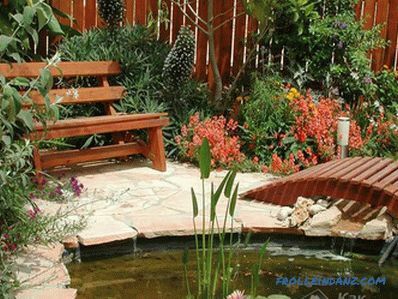 It is desirable to warm the sides of the foundation with sheets of expanded polystyrene and tar, and cover the top with roofing material. Schemes of fixing the beam to the wall. The first row is placed on waterproofing; for external walls, a bar with a section of 150x150 mm is used, internal partitions make it thinner. Immediately after laying the tree is treated with an antiseptic solution, which will ensure the best preservation of the timber and prolong its operation. Next, they install logs for the floor: they can be mounted on the walls of the log house or laid directly on the foundation. Lags are placed on the edge every 1.5 m so that they are in the same plane, and then fix them with dowels. The voids formed between the bars are filled with insulation, after which the rough floor is laid out of the boards. Roofing of a house from a profiled bar. Now you can continue laying the profiled beam: each new row is fastened to the previous one with the help of dowels that prevent the logs from moving. Metal dowels are stronger and more durable, but their use significantly increases construction costs. To install the dowels, deep vertical holes with a diameter of 4 cm are drilled in the timber; these holes are made through 2 rows, passing one, in a checkerboard pattern. That is, the first 2 rows are fastened, the third row is simply laid on the previous one, 4 and 5 are fastened with dowels again. The distance between the fasteners is about 1.5 m. To install the corners, you need to cut grooves at the ends of some bars and protrusions on others, which will increase the strength of the frame. As walls are erected from a profiled bar, openings for windows are cut out, ceiling logs are fixed, internal partitions are installed. To reduce the cost of building partitions, frame technology is used: at the locations of the walls, the frame is made of bars with a cross section of 50x50 mm, and then sheathed with clapboard. If the house consists of two floors, it is advisable to make the lower partitions from solid timber, since the frame structures are less durable. After the construction of the walls is completed, all surfaces are treated with a primer and a flame retardant to maximize the building's fire resistance and protect the tree from the external environment. 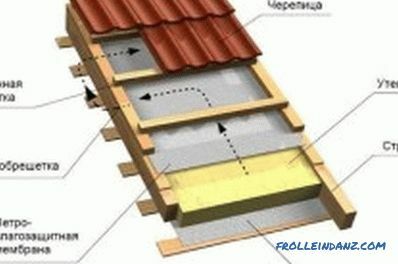 The treated surfaces should dry well, only then you can proceed to the final stage - the installation of the roof. Ceiling logs are attached to the walls from above, which serve as a timber with a section of 100x150 mm. 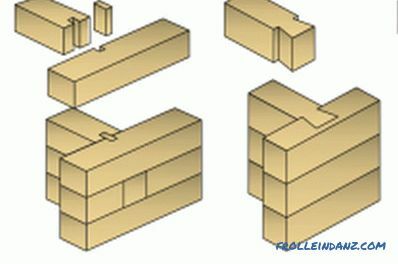 The length of the log should be 1 m longer than the width of the box, so that the bars protrude approximately 50 cm beyond the walls. The lags are laid on the edge at regular intervals. The recommended distance between the bars is 90 cm. Next, racks and girders are mounted that will support the truss system; 15 mm wide and about 50 mm thick boards are suitable for rafters. Gables can be made from a bar or siding, choosing the appropriate colors. The crate is nailed last with a step of about 40 cm and a waterproofing material is attached. For the roofing of houses from profiled timber, various materials are used: slate, soft tile, corrugated flooring and others. Their choice depends entirely on the preferences and financial capabilities of the home owner. At this construction can be considered complete, it remains only to perform finishing work inside the premises. At observance of technology of the main construction processes it will be simple to build a house from a profiled bar independently. High-quality material laying guarantees the entire construction high reliability and long-term operation.